We specialise in toilet fit-outs and we are able to plan and install to your exact requirements. Whether you are looking to refurbish the office or workshop toilet, we have the products and solutions to suit. As part of Commercial & Industrial Interiors commitment to offering the ‘complete package’ we provide a selection of toilet fit-outs and refurbishments, including plumbing, wall linings, vanity units, cubicles, ceramics, safety vinyl flooring, lighting and ventilation. We have installed and refurbished countless toilet and bathrooms and we have a great deal of experience and expertise in meeting the challenges of designing and installing bathrooms. As a leading name in toilet refurbishment and washroom refurbishment contracting we offer free advice and quotations on any toilet refurbishment and changing room refurbishment project. Our services include the supply of toilet cubicle panels, vanity units and associated materials, including toilets and wash basins etc. Toilet refurbishments can be designed using our in house CAD systems and we can include all fitting, plumbing and installation such as new ceilings, flooring, and building work. 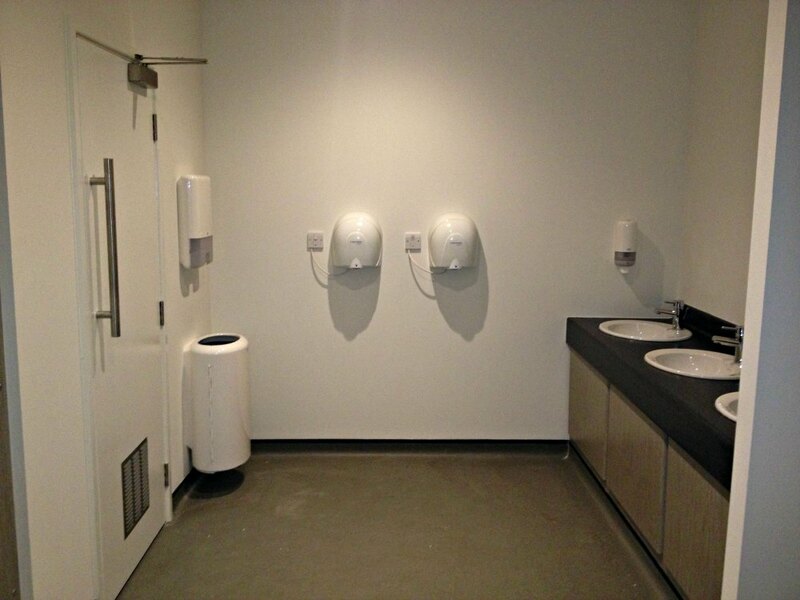 The Commercial & Industrial Interiors design team will work with you on any renovation project, including decommissioning the toilets and the rest room being made ready for the new toilet and bathroom. Floor and walls can be re tiled, toilet suites replaced, together with new ceiling tiles and appropriate lighting. CI Interiors can supply, refurbish and install virtually any toilet / rest room fittings available on the market. We offer advice and support on making the installation both quick and responsive to your business needs. More information on toilet refurbishments, can be obtained by speaking to our technical advice team on 0845 345 4228. We offer a wide range of Wall Linings to fit every business and every requirement. Vanity Units for small businesses, large offices, washrooms for shops and showrooms. 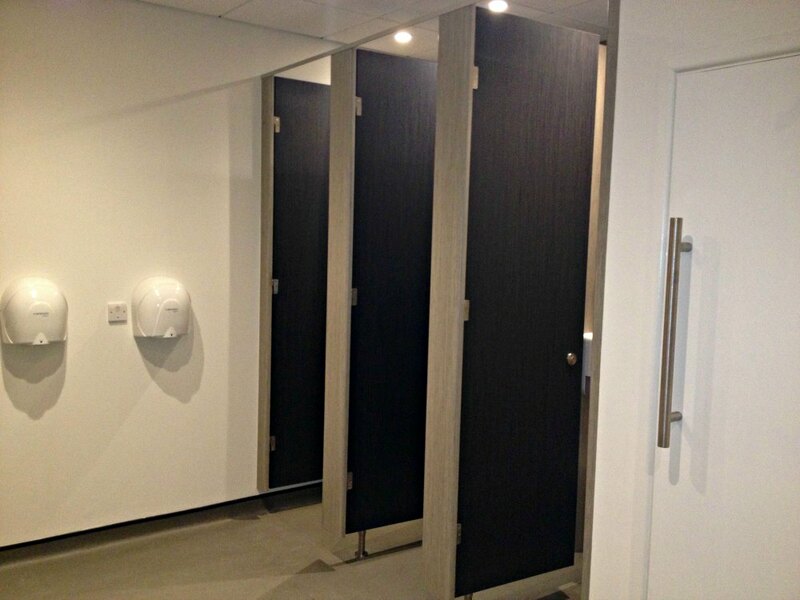 Our toilet cubicles are crafted using high quality fixtures and fittings. We have a number of prestige finishes that reflect your corporate identity on every level. We have extensive experience and knowledge designing and installing safety vinyl flooring. We can provide full electrical installations to provide a one stop solution. We have a wide range of solutions which can be tailored to your requirements. Call our friendly experts to discuss your plumbing needs in depth for a free consultation.